C-FLUG is a Cessna 150 owned by the Manitoba Chapter of the Ninety-Nines, International Association of Women Pilots (99s). The plane was donated to the RAA for the Manitoba 99s by Bill Vandenberg with help from Jill Oakes and Rick Riewe (see Canadian Aviator March 2014 article pages 20-23). Thank you to Jim Aitkens (AME) for volunteering to get C-FLUG into good working condition after sitting outside for a few years. 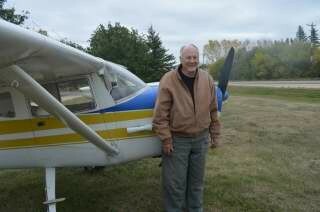 Leon Woychuck (AME) has generously volunteered to be C-FLUGs AME, he has 30 years of experience working with C150s at Harv’s Air and knows C-FLUG intimately. Thanks to the 100% support from the aviation community, C-FLUG is flown only by women – she can be borrowed by women with their Private or Commercial Pilots Licence for $20/hour! Women fly C-FLUG locally, nationally, and internationally. You’ll see C-FLUG flying overhead, across Canada, and into the USA – she’s flying to Oshkosh and to the C150 Fly-In this summer! Send womenflyfree@gmail.com a photo of C-FLUG at an airport other than her home base (Lyncrest Airport on outskirts of Winnipeg); your photo will be published on Facebook and you’ll get a free ride in C-FLUG. In addition, women interested in getting their pilots licence are invited to sit in C-FLUG, practise running through check lists, learn how to do a walk around, and participate in work parties and ground school sessions – all for free – so they can get a strong foundation on which to build their formal flight training experience at one of the local flight schools. Women pilots with non-Canadian pilots licences are welcome to attend any of the local flight schools to get their Canadian licences and then build hours on C-FLUG. C-FLUG is the only aircraft in North America we know of that provides below cost flying opportunities and ongoing support for women in aviation.